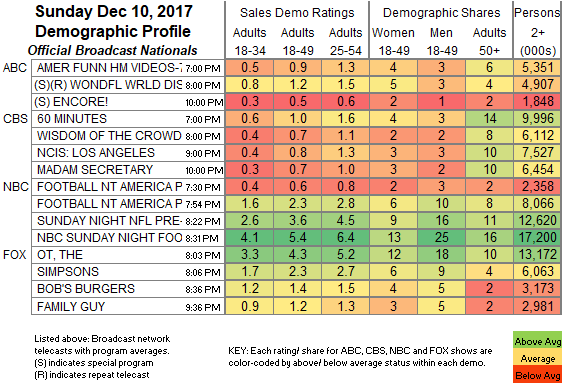 NETWORK FINALS: SUNDAY NIGHT FOOTBALL adjusted to 5.4, down a point from last week’s game, and football adjustment also accounted in the 0.4 drop for THE SIMPSONS and the 0.1 drop for BOB’S BURGERS. Elsewhere, 60 MINUTES lost 0.1 in final numbers. CABLE HIGHLIGHTS: It’s the same good news/scary news for AMC’s THE WALKING DEAD as it’s been for a while. The midseason finale was bigger than anything else on scripted television besides GAME OF THRONES, up 0.08 from last week to 3.36, but that was down a giant 1.73 from the 2016 midseason finale–and 2016 was down 1.93 from 2015. That’s a 34% year-to-year drop, and an incredible 52% over 2 years. Even at that rate, WALKING DEAD should have several more years left in its tank, but there’s a chance that THIS IS US will be outrating it a year from now. TALKING DEAD gained 0.19 to 1.35, down 0.62 from the 2016 midseason finale edition, and COMIC BOOK MEN was up 0.02 from last week to 0.24. On Starz, the season finale of OUTLANDER ticked up to 0.30, and it was followed by a “sneak” of the pilot for January’s COUNTERPART at an unpromising 0.08. On Showtime, SHAMELESS fell 0.07 to 0.50, SMILF rose 0.03 to 0.20, and the season (?) finale of WHITE FAMOUS ticked up to 0.12. Elsewhere in scripted, Adult Swim’s ROBOT CHICKEN returned at 0.55, with SQUIDBILLIES down 0.03 to 0.36, and THE JELLIES down a tick to 0.33. Hallmark’s Sunday movie SHARING CHRISTMAS was at 0.55, very steady with last Sunday’s 0.58. TBS’s SEARCH PARTY was at 0.19/0.12, compared to last week’s 0.22/0.15. TNT’s GOOD BEHAVIOR rose 0.04 to 0.19. Unscripted was led by Bravo’s REAL HOUSEWIVES OF ATLANTA, up a tick to 1.01. On TLC, 90 DAY FIANCE slipped 0.03 to 0.60, and UNEXPECTED was down 0.05 to 0.29. On E!, KEEPING UP WITH THE KARDASHIANS gained 0.05 to 0.46, and WAGS was up 0.03 to 0.21. Univision’s LIGA soccer match was at 0.38, and NBC Sports Net’s Premier League match was also at 0.38. On Food Network, GUY’S GROCERY GAMES ticked up to 0.32, and the finale of GUY’S BIG PROJECT was at 0.17/0.16 compared to last week’s 0.21. Discovery’s ALASKA; THE LAST FRONTIER was at 0.28 compared to last week’s 0.40/0.29. 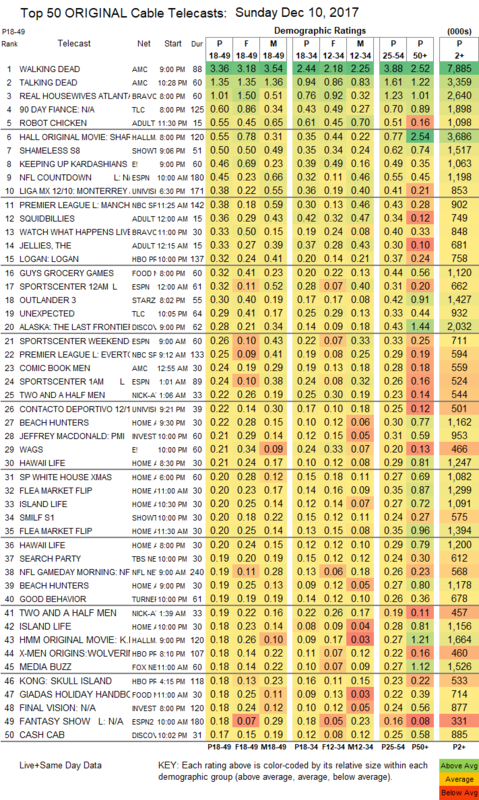 HGTV’s line-up was led by BEACH HUNTERS at 0.22/0.19, compared to last week’s 0.19/0.15. ID’s JEFFREY MCDONALD: PEOPLE MAGAZINE INVESTIGATES was at 0.21.